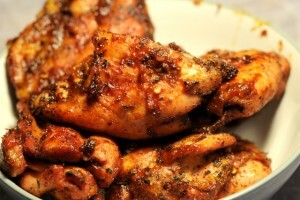 Easy Bar Bq Chicken recipe by Ayesha Razzaque at DesiRecipes.com. Slightly different and easy way of making Delicious bar bq Chicken. Mix all the spices, vinegar , ginger /garlic paste and the food colour. Prick the chicken pcs with a fork. Take chicken pieces and use lemon halves to rub the spice mixture on the chicken pcs. After that put these pieces on a griddle (tawa on which we make roti)to dry water in the chicken . AFter that put these pieces on skewers and cook on stove flame. Put these pieces in a pan and cover on low flame for some time. These will taste just like real Bar BQ chicken and save you the hassle of burning coal. and sit infront of the grill. Serve with chutnee and nan.